Jean-Baptiste Le Moyne de Bienville, governor of New Orleans, attack the Chicksaw Indians. The remains of three elephant-like animals were found in a swamp beside the Ohio river, near what is Louisville today. Longueuil retrieved a tusk, a leg bone (femur) and some molar teeth. When the campaign was over in 1740 he sent the bones to Paris, where they became the subject of much scientific speculation. One of the teeth was first described by Jean Guettard, a Swiss geologist, in 1752. In a paper to the French Académie des Sciences that was accompanied by the first attempt at a geological map of America, Guettard asked, 'What animal does it come from? Does it resemble fossil teeth of that size which have been found in various parts of Europe?' At the time he had to admit that 'those are two points on which I was unable to shed any light'. Jean Etienne Guettard, 1715-86, Swiss geologist who studied medicine in Paris and was keeper of natural history collections for the Duke of Orléans and published a mineralogical map of France and England. But 10 years later in 1762, a young French anatomist, Louis Daubenton, compared the remains with those of an elephant and a Siberian mammoth. He claimed that the femur and tusks, although of different sizes, were otherwise so similar that they belonged to the same species, some variety of elephant like the mammoth. Daubenton, like most naturalists of his time, believed that species were fixed entities, that there was no such thing as extinction, and that any variation was no more than differences of breed or race. Consequently, the marked differences of the molar teeth from those of elephants could only mean that they belonged to some other species. Since they bore some resemblance to hippopotamus teeth, he concluded that the remains of two quite different animals had been mixed together. New discoveries at Big Bone Lick in what is now Boone County, Kentucky, southwest of Covington (near Cincinnati), soon resurrected the argument over what subsequently became recognised as a distinct species, Mammut americanum, the American mastodon. From the 1750s, large numbers of bones were recovered from marshy ground surrounding a salty spring beside the river in the upper Ohio valley. We now know that many animals, attracted to the site by the salt lick, became mired in the marsh and perished there. Over subsequent decades bones collected from the site were dispersed all over the place, including some that, in 1767, reached London. Others were excavated from Big Bone Lick by William Croghan, a Dublin-born Irish protestant whose family had settled in Pennsylvania in 1741. William Croghan, 1770-1830, Dublin-bom Irish protestant trader whose family emigrated to America and settled in Pennsylvania in 1741. He collected fossils as a hobby, especially from Big Bone Lick in Ohio, and communicated with Franklin about them. From the size and shape of the bones and tusks, Croghan concluded that 'they are the bones of elephants'. After many adventures, which included being held captive by American Indians, Croghan arrived in New York with his precious bones. From there he sent specimens to London, both to the Scots physician and pioneer of comparative anatomy William Hunter and to another American polymath who combined politics and science and was living in London at the time, Benjamin Franklin. From his study of the bones and teeth, Hunter argued that they did indeed belong to a single species but a very unusual one - a carnivorous elephant. Furthermore, wrote Hunter, 'though we may as philosophers regret it, as men we cannot but thank heaven that the whole generation is probably extinct'. William Hunter, 1718-83, Scots physician to Queen Charlotte, pioneer of comparative anatomy and collector of natural history whose specimens were acquired by Glasgow University and form the basis of the Hunterian Museum there. Brother of John Hunter, also a physician and collector. Benjamin Franklin, 1706-90, American polymath and statesman, apprenticed to his brother as a printer, then journalist and publisher, appointed postmaster of Philadelphia (1737), began experiments on electricity (1746), elected to the Assembly, sent to England as diplomat (1757-75), to Paris in 1776 to seek assistance against the British, and on Independence was made American ambassador (1783-5), returned to be President of the state of Philadelphia. Society in 1767. Collinson also thought that the remains were those of a single kind of unknown animal related to the elephants, because the molars with protuberances were always found with the tusks and other elephant-like bones. 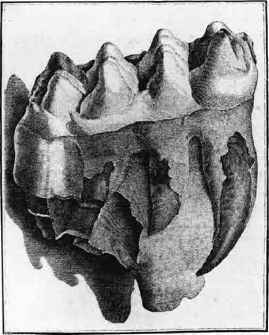 However, the detailed anatomy of the molars suggested to him that they belonged to a plant eater. To begin with, Franklin agreed with Hunter's diagnosis and added that since elephants 'now inhabit naturally only hot countries where there is no winter', how could such animals inhabit the Ohio valley and Siberia? Apparently, concluded Franklin, 'the earth had anciently been in another position, and climates differently placed from what they are at present'. The following year, 1768, Franklin, who was an acute observer, reconsidered the subject and came around to Collinson's line of thought. Furthermore, the knob-like protuberances on the molar surfaces 'might be useful to grind the small branches of trees, as to chew flesh'. Georges-Louis Leclerc, Comte de Buffon, 1707-88, French son of a wealthy lawyer and also studied law, but devoted himself to science. Director of the Jardin du Roi (1739) and author of a 44-volume Natural History (1749-67), made Comte de Buffon by Louis XV. The most famous naturalist of the time was the French aristocrat Georges-Louis Leclerc de Buffon and Collinson submitted his conclusions concerning the Ohio animal to him in 1767 as a series of questions or problems. The tusks are elephant like but the teeth more resemble those of the hippopotamus. If they did belong to a single animal, then it was clear that animal was very different from any that were living and was therefore 'lost'. There are no elephants living in America and anyway they only lived in hot countries such as India and Africa. How could such a paradox be explained? The huge fossil cheek teeth found in Ohio in the 18th century puzzled naturalists such as Buffon because they have a bumpy 'mammilated' surface typical of a hippo and yet were found associated with elephant-like tusks. both elephant- and hippo-related animals. 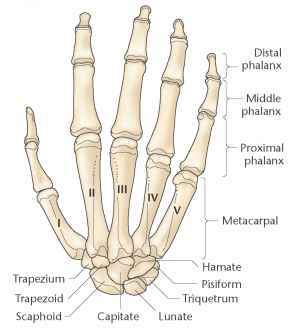 Indeed, he refused to accept the common co-occurrence of the different skeletal remains and thought that he could detect the presence of three different species! But more important was his consideration of the problem of their occurrence in countries with severe winters and the question of their extinction. Although he was 77 years old when he wrote Les Epoques de la Nature, it was a monumental work and perhaps Buflfon's most enduring scientific legacy. In it he framed the whole of Earth history and performed experiments from which he calculated its age as 75,000 years. Buflfon divided his version of Earth Time into seven epochs, within his concept of a slowly cooling Earth to which we will return (see p. 401). For Bufibn the presence of elephant remains in high latitudes such as Siberia was important supporting evidence. He argued that during the fifth episode of the Earth's cooling, in a chapter entitled 'When Elephants and Other Southern Animals Lived in Northern Lands', high regions became habitable first and were occupied by life that could tolerate the heat. But as these regions cooled further, the animals were forced to migrate to lower latitudes such as America and Europe and then on further to the tropics. Finally, in the seventh epoch humankind appeared. Bufibn also argued that the Ohio animal was extinct, having perished as a victim of climate change associated with the cooling of the Earth. Although in modern terms Buflfon was wrong in many of his conclusions, his line of reasoning presented an important breakthrough in how naturalists came to view the Earth and its history. His eminence and influence were such that he could 'afford' to distance himself from religious dogma. He argued that we could 'compare nature with herself and work back from her present, known state, to several epochs of a more ancient state'. His 'actualistic' approach avoided divine intervention and miracles. It was to become a guiding principle of modern science and of particular importance within the earth sciences.